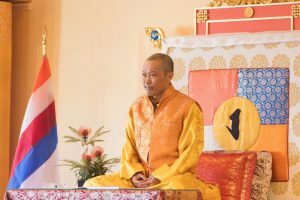 Celebrating the Earth, the Sakyong will perform a two-day long-life puja, or accomplishment practice, this April 29th and 30th in Boulder, Colorado. This puja is performed to assist in healing the sick, and to strengthen the life-energy of those engaged in virtue so that their activity and aspirations may flourish. In addition to the benefit for individuals, the Sakyong is also dedicating this particular puja to healing the natural world and fostering well-being, balance, and peace. Throughout the year, the Sakyong receives many requests for blessings and bi-annual pujas are a powerful way he fulfills these requests. Pujas are also a traditional responsibility of lineage holders. They are occasions for the Sakyong to dedicate meditation toward situations in need of assistance, and to do specific practice for the royal family lineage of Shambhala. The Sakyong has performed these pujas for many years. This was initially unknown to the community at large, but they are now publicly acknowledged and interest in them is growing. If we wish, we can request the Sakyong to direct his practice to benefit ourselves, our loved ones, friends, centers, or activities. Although not required, people often make an offering to the teacher when requesting practice. 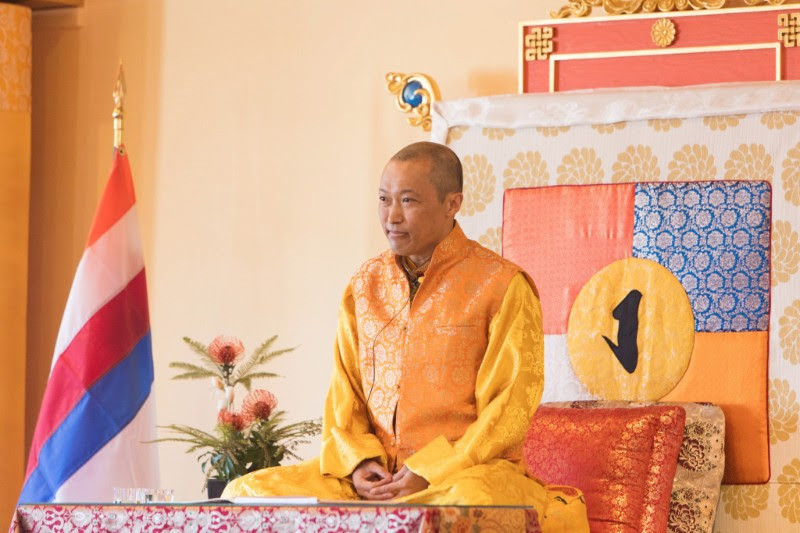 The Sakyong requests that those wishing to connect with the pujas offer red and yellow flowers in special places in their homes or centers during his practice. We can do this with a sense of joining the Sakyong in heart and mind to heal the earth and humanity, and with the aspiration that his wishes for Shambhala and the individuals requesting his blessings be fulfilled. Students who have already received the Sakyong’s White Tara sadhana are encouraged to do that practice on the days of the puja. White Tara is one of the main feminine deities of long life and health in the tantric tradition. She embodies the environmental qualities of kindness, protection from harm, and soothing suffering. Thank you, Your Holiness, for listening to our prayers and for allowing us to join you in praising all those in need, and for the betterment of All. If I can be so humble to request your blessings for a dear friend, Paulina Weiler of McHenry, Illinois. She is going through an extreme trial that is testing her to the foundations of her morality. I feel connected to her deeply at the soul level, and I know she is a warrior but she has come to feel almost defeated. She has been finding the courage to do the right thing but with each step the consequences become more severe. I pray she can get through this dark forest to the light of Truth that she seeks. I do not have anything to offer monetarily, but I dedicate myself daily to improving myself and have found tremendous spiritual sustenance in your dedicated lineage. I give nothing but thanks and outpouring love to you and your lineage and to all who seek to see the Light of Shambala.